This hotel is nice and clean and in a excellent location in Deerfield Beach.We loved this hotel. The rooms were great, large, clean with good furnishings. The front desk staff were incredibly helpful. Location was absolutely perfect and I think it's the nicest hotel in the area and very reasonably priced. Small things like laundry being quick and very cheap made it a wonderful stay! I would recommend this hotel for anyone staying in Deerfield Beach. What a great location! 1 block to the beach, 4 blocks to the pier and multiple restaurants. We did not have a car here and never missed it....spent 1 whole day in bathing suits, what's not to love about that. The hotel is not new but very clean. The owners are great, very helpful and firendly. Our room had a fully-equipped kitchenette, full size refrigerator, stove and microwave. We did not use most of that, but it was nice to have available. The room was clean and quiet, and the pool was just the right temperature. Deerfield Beach is a great place to kick back for a few days in winter! This motel is cozy and clean with a nice homey feeling. The staff is very friendly and helpful. It is a short stroll to beautiful Deerfield Beach and close to restaurants and shopping. Nice pool too! Wr had a nice week! We recently spent three weeks total in 2018 at the Carriage House. The staff is smiling and helpful. The efficiency apartment was very clean and the kitchen was well supplied. Ample towels and toiletries in the bathroom as well. 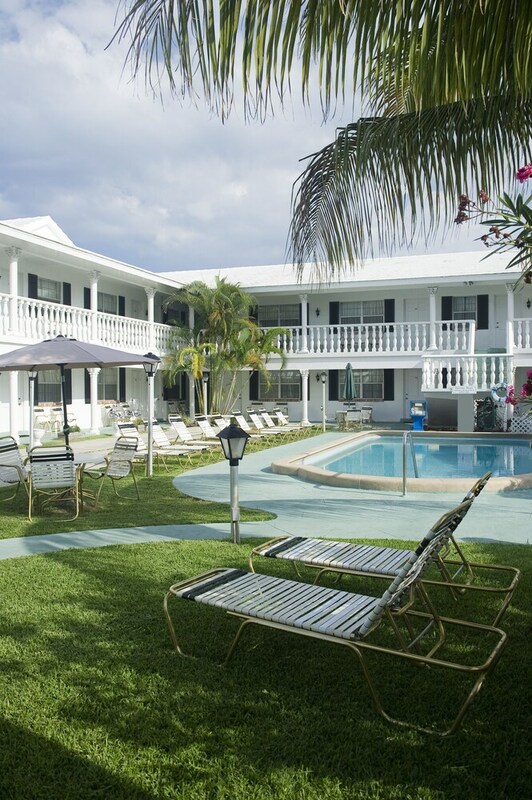 This hotel is a gem....one block from the beach as well as a well maintained pool. Easy two block walk to restaurants and small stores. My only criticism would be their charge to use the room safe. Hello all. This is being written while I am still here. It's my second day (here for a staycation at the beach), and the Carriage House is more than I expected. I booked their "Hotel Room" -- their most basic option. There are also Studios, and One- and Two-Bedroom rooms available here. Also, it's like the United Nations at this hotel - I heard three different languages this afternoon in the course of ten minutes! :) No, this isn't a four star fancy, shiny hotel; it's true to exactly what it claims to be... a small, old-school, beach resort hotel. The only reason I didn't give this review five stars is because they don't have some of the amenities of the bigger places. That's not their business model. They're just really good at what they do offer. PROS (In no particular order) * The Wi-Fi is Strong * Super Nice Office Staff. I didn't interact much, but they were all smiling and friendly when I did. * Rosa, my housekeeper * Cold A/C in the room * Plenty of room lighting. Both lamps by the bed had an outlet. Sometimes, these older hotels don't offer enough places to plug things in. * Two Comfy Chairs in the room * The "Hotel Room" does not offer a Coffee Pot, but when I asked, they brought one up right away. Filters, too. * The Desk Area in the room has ample space to work * Speaking of ample space, the room itself seems larger than I counted on. It probably isn't but it feels that way. Two large closets in the unit. * The Bed is Comfortable * The entire property is clean and well-kept. For example, none of the lounge chairs by the pool are missing slats or falling apart * Plenty of free Parking * Location - just a short 4 block walk to the area with plenty of stores, bars and restaurants. * Location - less than a block to the beach CONS (I am being really picky here - there's really nothing to complain about) * 32" TV in the room. I am spoiled by larger sets these days * Couldn't VPN to my office via the Wi-Fi. I had to connect from my phone * No housekeeping on Sunday. Not really a con; just need to note that somewhere I also liked that I didn't have to price shop. The prices on their website were the same as I found elsewhere. And reserving on their site was easy - I got a response and confirmation right away. Would I stay here again? Well, I stopped by the office a few hours ago to book another weekend next month! We were at this hotel in 2017, and had such a great vacation we decided to go back this year 2018. It was great! One bedroom unit, which had two full size beds in the bedroom and a pull out sofa bed. Kitchen fully equipped (with refrigerator, oven and stove, coffee maker, toaster, utensils). Everything is clean and the staff is super friendly, you can tell they really care about their property and their guests. Room is cleaned and towels restocked every day (except on Sundays). Only one block to the beach, close to everything the beach area of Deerfield Beach has to offer. The pool was clean and plenty of seating. Washer and dryer are available on the property. Overall - relaxing and quiet. Great price. We already made our reservations for next summer! Thank you Carriage House for accommodating our family. Pros: location! One block from the beach. Large rooms and cabinet space under sink. Mini fridge and small microwave. Cons: not enough towels in the rooms, no coffee maker in room, no hair dryer unless you ask for one, not a courteous staff. We stayed at the Carriage House for 2 weeks in April. We booked 3 rooms and had 4 other couples with us. We all had the best time. The rooms were beautiful, great size, and very clean. Our daughter and her family had an efficiency room and it was the perfect size with the baby. The pool was wonderful and spotless clean. We all enjoyed the shuffle board. Really there was nothing negative about this property. To top off our wonderful experience, Suzanna was perfect and patient with all of our questions and needs! Deerfield Beach Pier is a short stroll from Carriage House Resort Motel, and other popular attractions like South Beach Park are within a few miles (5 km). This 30-room motel has an outdoor pool, free in-room WiFi, and free self parking. A flat-screen TV comes with cable channels, and guests can stay connected with free WiFi. Other standard amenities include a refrigerator, a microwave, and free local calls. Limited housekeeping is available. Guests of Carriage House Resort Motel enjoy features like an outdoor pool, free WiFi in public areas, and a terrace. Free parking is available if you drive. Front-desk staff can help with concierge services, and provide local restaurant recommendations. Additional amenities include laundry facilities and a garden. Recreation features at Carriage House Resort Motel include an outdoor pool. This property's front desk is open daily from 7:30 AM - 8 PM. Guests with plans to arrive after 8 PM must make arrangements in advance by contacting the property using the information on the booking confirmation.